Christies, London, 23 May 1989, lot 179; Karin Henninger-Tavcar, 1990; Private Collection, Germany. The sitter is possibly a Miss E Lambert, painted four years after Smart’s son, John Smart junior, first portrayed her and her sister, a Miss L Lambert. By this date John Smart senior was exhibiting regularly alongside his son at the Royal Academy, presenting a portrait of ‘Mrs Smart’ in 1804. 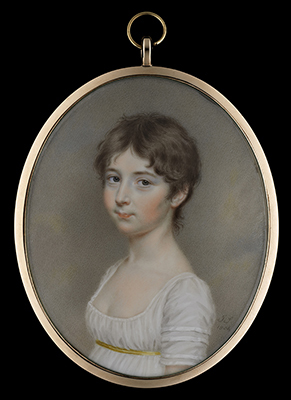 In terms of eighteenth century portrait miniature painters John Smart remains one of the most coveted and desired. The eighteenth century was a highly prosperous period for the miniature painter and when compared with his contemporaries such as Cosway or Engleheart, Smart’s style feels a lot more restrained and less flouncy then his peers. He therefore appealed to a different set of patrons who cared less for swagger and more for delicacy and clarity of features. In 1755, at the age of thirteen, Smart began to enter pencil and chalk drawings for prizes at the Society of Arts. Smart established himself in the early 1760s and these early years provided Smart with the necessary confidence, contacts and drive. In 1765 he was elected Fellow Royal Society of Artists (FSA), becoming Director in 1772, Vice-President in 1777 and finally President in 1778, a position he held until the society’s liquidation.